Dot Fernandez, left and Cindy Manske, center, run Freedom Foundation Ministries, which mentors female prisoners in Topeka. Diana Jurik, right, is an ex-convict who has gone though their program and continues to be mentored by Fernandez. Diana Jurik left home at 12. She was an alcoholic by 14 and a school dropout by 16. By 36 she had been in prison five times and convicted of nine felonies. But age 37 has been different. Jurik is working and staying clean. She is going to school and learning there are people in the world who care about her. “I feel like somebody worth something,” she said, sitting between the two women she credits with much of her success. 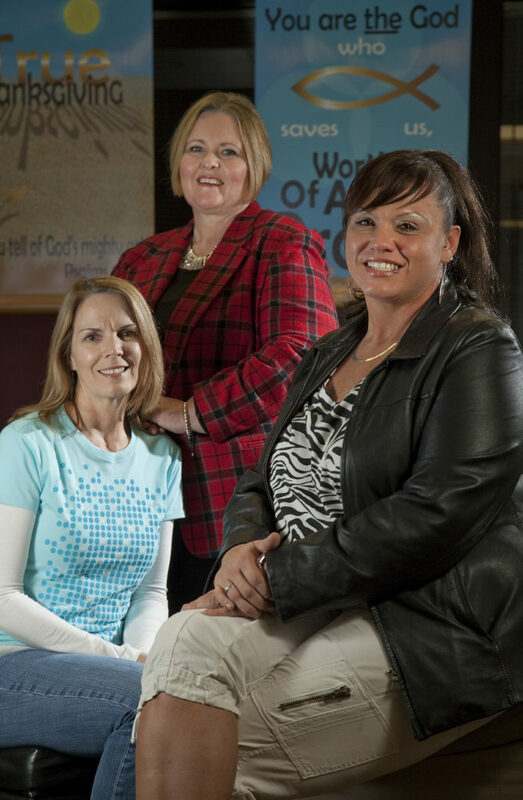 The women are Dot Fernandez and Cindy Manske, co-founders of Freedom Foundation Ministries. Since last June, they have been holding life-skills classes for women in Topeka Correctional Facility and pairing them with mentors for when they are released. The group also offers optional religious services. “It’s important for them to have that support from somebody who doesn’t want anything from them,” Fernandez said. After Jurik was released from prison last April, Fernandez helped her get a job at a restaurant and enroll in cosmetology school in Topeka. She has also helped Jurik avoid her old way of life, which included alcohol abuse and bad relationships. She was convicted multiple times for forgery and drug possession. Jurik said she has had one addiction relapse since being released from prison. In the past, that would have been the beginning of a downward spiral that likely would have ended in another prison cell. This time she called for help, and Fernandez spent an emotional hour in a cafe counseling Jurik. Jurik said she has been clean since. “I’ve used her to pick me up when I’ve fallen,” Jurik said. Kansas was recently a model for helping people like Jurik. In 2007, former Gov. Kathleen Sebelius signed legislation to grant up to 60 days in reduced sentences for inmates who attended offender re-entry programs and appropriated $4 million in grants for communities with plans to reduce recidivism. Kansas was among the top three states with the largest improvement in its recidivism rate from 2004-2007, according to a 2011 Pew Study, and its inmate population fell 5 percent from fiscal year 2006 to fiscal year 2009, according to the Kansas Legislative Research Department. Gov. Sam Brownback, then a U.S. senator, championed a bipartisan bill inspired by the Kansas law. It was later signed by President George W. Bush and became the Second Chance Act, which awarded grants to governments and organizations that helped offenders better return to society. But Kansas’ fiscal woes have taken a toll on such programs, and the Kansas inmate population has been back on the rise. Every year since fiscal year 2009, there have been more people in Kansas prisons and jails than the year before. There were 9,186 prisoners in September 2011, the highest number in a decade. It’s a trend the Department of Corrections worries will continue given current funding levels for offender programs. The Kansas Legislative Research Department included that concern in its 2012 legislators’ briefing book, a guide of issues provided to state lawmakers. Fernandez believes her program is allowed access to the prison because of the state’s diminished ability to provide such services. But she praised Brownback, who has called for every Kansas inmate to have a mentor during the months before and after they are released. “I know he (Brownback) isn’t always the most popular, but that’s something very positive he’s done,” Fernandez said. As of December, 500 volunteers have been recruited for Brownback’s Mentoring 4 Success initiative. Manske, the other Freedom Foundation co-founder, acknowledges the teaching and the mentoring is time intensive and affects relatively few. They have resources to help just 10 women each year. To her, it’s still progress. “It’s one woman at a time,” Manske said. Jurik has 12-year-old twins, a boy and a girl. They live in Louisiana, and she hasn’t seen them since they were 3. A few weeks ago, their father unexpectedly emailed her a link to a Facebook page he had created. She opened it up and saw pictures of her twins, happy and doing well. She hopes she will get to see them again.